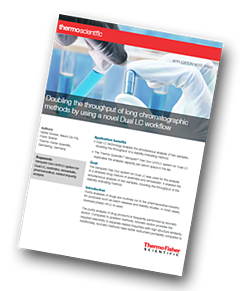 Thermo Fisher Scientific has produced an application note describing a novel Dual LC workflow, which provides a unique concept by using two separated flow paths in one system. It shows how the Thermo Scientific Vanquish Duo system for Dual LC enables the analysis of two samples simultaneously, allowing the same number of samples to run in half the time. Purity analyses of drugs are routinely run in the pharmaceutical industry for purposes such as batch releases and stability studies. In most cases, reversed-phase HPLC is used. The Dual LC workflow is demonstrated here for an isocratic stability-indicating method to profile the combined impurities of simvastatin (SMV) and ezetimibe (EZE) that are drugs used to reduce the total cholesterol value and triglycerides in blood. The Vanquish Flex Duo system for Dual LC provides two separated fluidic pathways in one instrument. Each flow path consists of a sample loop and column, and each is connected to a variable wavelength detector. The same chromatographic method was applied to both flow paths. First, the reference samples for the EZE and SMV were run simultaneously by the Vanquish Flex Duo system for Dual LC to generate the reference chromatograms. Afterwards, the stressed sample was analysed using the same method on both flow paths. The Dual LC capabilities increased the number of analyses run on one instrument from 19 to 38 per day for this method with 75 minutes total run time. The Vanquish Flex Duo system for Dual LC duplicates the analysis capacity per bench space in the lab. Chromatographic results of both flow paths of the Vanquish Flex Duo system for Dual LC exhibit very good consistency both in relative retention time and relative peak area.